Form Description: This form is a very basic vehicle inspection report. Designed to be filled out by the driver of a vehicle prior to the beginning of their shift, or before they begin operating their vehicle. Simple in nature, this form has columns for you to mark the status of a particular problem, a description of that problem, as well as the time it took to repair the problem. 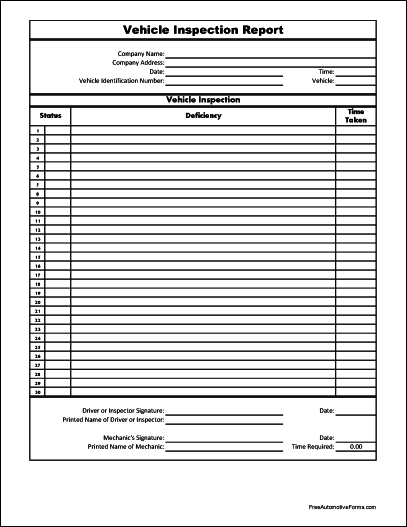 In addition, this form also has numbered columns which make it a little easier to keep track of what line you are working on, as well as the ability to track the total time spent on the vehicle. When the noted problems have been fixed, the company mechanic can simply sign off on the form to signify that everything has been fixed. You can download a PDF version of the "Numbered Vehicle Inspection Report with Total Time" form absolutely free. You can also, for a small payment, download a fully editable version of the form that you can customize as you desire. (Don't know which format to choose? Here's how to make your choice.) What would you like to do? FreeAutomotiveForms' free "Numbered Vehicle Inspection Report with Total Time" form is associated with the following keywords: automotive, driver, inspection, vehicle .